You are here: Home - SHOPS - Miyamoto Unosuke Co.,Ltd. 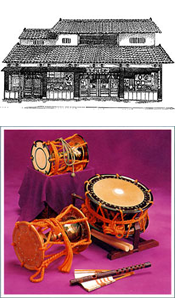 Founded in 1861, for the past 145 years we have specialized in the manufacture of taiko drums and other musical instruments for festivals. Our store is located in Asakusa, in an area that used to abound in Kabuki theaters. Over the years Miyamoto Unosuke has produced countless taiko drums for temples and shrines, and for use in Gagaku, Noh, Kabuki and various other types of folk entertainment. We also manufacture “mikoshi” or portable shrines for use in festivals such as the Sanja Festival in Asakusa. Miyamoto craftsmen strictly adhere to methods handed down from generation to generation, but at the same time exercise creativity to produce taiko drums and other musical instruments as well as mikoshi, all of which are widely acknowledged for their splendor and durability. In our store you will find a wide selection of drums and other festival goods and costumes, all of which make wonderful gifts or souvenirs. In addition to our store we also have the world’s first museum dedicated to drums, and our Miyamoto Studio where you can learn to play traditional Japanese music.